Caring for your home is an important responsibility that requires continuous maintenance. However, some tasks are too difficult to take on alone. That's where Sears Handyman Services comes in. Our expert technicians know how to handle various home improvement tasks so you can check them off your to-do list. From plumbing problems to building decks, they have the skills to complete a wide variety of projects and keep your home well maintained. Call our technicians today for all your minor to intermediate home repair needs. Give us a call at (512) 640-4061. For a variety of minor electrical repair needs, trust Sears Handyman Services. If you need LED and recessed lighting installed or need ceiling fans and other lighting fixtures replaced or repaired, we can help. Minor electrical problems often don't require a professional electrician but still remain outside a homeowner's skill set. That's where our handymen can help. Drywall is commonly used to construct modern homes. This material may be portable and sturdy, but it can be damaged if struck by hard objects. Sometimes it can look rather unpleasant if nails have been used to affix objects to the walls. Our trained handymen know how to hang, tape, patch, and repair drywall. They will start fresh or fix existing drywall, whichever option fits your needs. Maintaining a deck can be a burdensome responsibility. If you're in need of deck repair and maintenance, our handyman technicians are prepared to help. They can stain your deck, prevent water damage, fix-up wood rot on an existing deck, and even build a brand new one. Your family deserves a place to relax, entertain guests, or have a barbecue. For all your deck maintenance needs, call Sears Handyman Services. Sometimes it's nice to have privacy in your back yard. A fence can help with that. 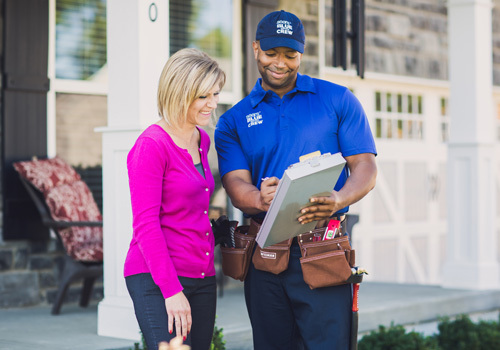 From concealing privacy to decorative picket or even the more economic chain link, Sears Handyman Services can install it all. Rejuvenate the interior and exterior of your home with a new coat of paint. Painting can take a lot of time that many homeowners just don't have with busy modern schedules. To some homeowners, using a ladder can be quite the struggle as well. Trying to reach up to the ceiling or peel off the wallpaper is no easy task. If you could benefit from help with removing wallpaper or painting, call Sears Handyman Services and leave the rest to us. Our staff will help you maintain your home, and keep it looking great.